As budgets expand or money becomes available at the end of a school year, the knee jerk reaction of many schools is to go all in and spend it as quickly as possible. With advances in affordable technology, such as the ultra-cheap Chromebook, it has been tough for schools to resist spending these funds on devices. Now don't get me wrong, I am all for schools increasing student and staff access to quality technology. However, the cart before the horse scenario has played out in so many schools across the globe. The end result has been a massive influx in tools, but a clear lack in vision and planning as to how these powerful tools can, and will, actually impact learning. 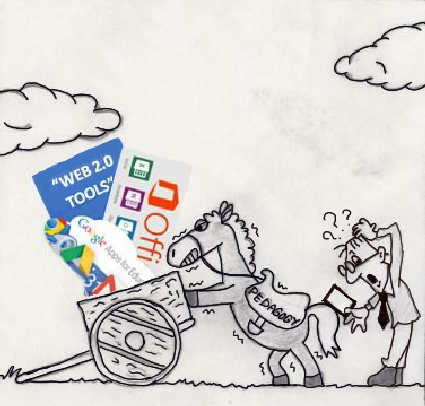 In some cases the technology resides unused in classrooms and schools due to the cart before the horse approach. There is nothing transformational about this. There are many technology frameworks out there for schools to refer to such as SAMR, TPACK, and the TIM. The SAMR Model has provided us with a good lens to observe firsthand the need for proper planning prior to investing large amounts of money on technology. This by no means is a perfect framework to guide the effective implementation of technology initiatives, but it does give us a good idea of what should not be taking place. I have visited one too many schools where I have seen time and time again devices being used in ways that serve as a direct substitute for the same ineffective practices that we are trying to move away from. Technology in itself will never transform teaching and learning. Students, teachers, and leaders who effectively integrate technology with purpose aligned to learning and leadership outcomes will. The quote at the beginning of this post from William Horton provides an important reminder of the critical need for teachers to be supported in proper instructional design prior to any massive technology roll out. We found great success at my school during our digital conversion by focusing on a pedagogy first, technology second if appropriate mindset. Not only was there a focus on solid instruction, but we also provided numerous supports for our teachers in the form of ongoing and job-embedded professional learning opportunities. If the expectation was to integrate technology with purpose to support and/or enhance learning we made sure everyone was prepared to do just that. As Michael Fullan has stated, pedagogy is the driver and technology the accelerator. It is not just teachers that need work on instructional design when it comes to effectively integrating technology. The same goes for school leaders who also deserve support in the form of professional learning so that they can properly observe and provide valuable feedback to teachers when technology is being integrated in lessons. Ultimately it is a leader’s overall responsibility to make sure technology purposes are having an impact on learning. Thus it is wise to put them in a better position to do just that. The critical need for learning doesn't stop with teachers and leaders. It also extends to students and parents. As learning changes with successful technology integration and students begin to have more access to technology, a golden opportunity arises to not only address critical digital literacies, but also responsibility. When rolling out either Bring Your Own Device (BYOD) or 1:1 initiatives create programs to prepare students for the purposeful use of technology to support their learning. In the end this will mitigate many issues before they arise. At my school I met with all the students in large-scale assemblies to educate and reinforce the role of mobile learning devices at the beginning of the school year. Having parent programs in place is also vital to the success of any major technology initiative. With large scale purchases they will want to know the impact on learning and others will need guidance on the how teaching and learning is now changing. The importance of getting instructional design right cannot be stressed enough. Don't fall victim to the cart before the horse scenario. If you or your school has the ability and funds to purchase technology, don't rush to get it into the hands of staff and students. Take the time to develop a shared vision and plan for integration that aligns with sound pedagogy. Consider using the trudacot developed by Scott McLeod and Julie Graber. This discussion protocol will allow you to work on instructional design within the context of student agency and higher-order thinking skills. Provide professional learning opportunities before, during, and consistently after the roll out. After a focus on instructional design, work with students and parents to build broader support. In the end this will help to not only make the implementation process easier, but also to have your technology initiatives primed to get results. Excellent points and advice. I work in a new school, fully equipped with the latest in technology, iPads, monitors etc. My favorite day happens when I have planned a great lesson, that requires the used of tech., and the wifi isn't working! Then it's back to old school teaching. We are limited by technology in some respects and I am glad that I am not dependent on it! Thanks Pauline! If instructional design is sound technology failures (as you state) won't have a significant impact. Great post, Eric. You hit the nail on the head. My district is being promised Chromebooks for every third through eighth grade student this fall, but there has been no/minimal conversation on how this is going to impact our teaching. My fear is that someone has the thought: "Well, I purchased it. Let them figure out how to use it." I may be borrowing several of your ideas to see if we can have this very important conversation before too many teachers become frustrated with the technology. Thanks for chiming in Jim! I see this mistake all too often. Technology in itself will not transform education; educators the effectively integrate technology with purpose and sound pedagogy will. Seems like your district has a great deal of work to do or else there will be a whole lot of digital pacifiers in the hands of students. "I have visited one too many schools where I have seen time and time again devices being used in ways that serve as a direct substitute for the same ineffective practices that we are trying to move away from." This is one of my biggest concerns. I often see worksheets, for example, translated to a digital format. How do you combat this issue? In what ways are teachers transforming learning through digital tools? What advice do you have? We are planning to begin a blended learning initiative in our district this school year and I welcome any and all advice about how to approach it as a teacher and leader. To combat the issue proper planning and support is needed. If your district hasn't already try to get your superintendent to sign the Future Ready Schools pledge http://www.futurereadyschools.org. There are so many free resources here that allow you to see where your district/school is at with technology and to guide you through the planning process before implementation. In the end to all comes down to the professional development for teachers and admin prior to the rollout. After that there has to be consistent monitoring and a feedback loop to avoid technology being used in ineffective ways. Overall, your post really highlights and summarizes my findings from my research in grad school. I did a lot of research about best practices in educational technology. I repeatedly found that teachers need to be supported to integrate technology effectively. I agree that proper planning is definitely needed, too, but this step can be really overwhelming. I consider myself to be a digital native (and I am a teacher), and sometimes finding the right resource to enhance my instruction can be daunting and very time consuming. My former school had a technology integration specialist who helped support teachers, in the classroom, to find resources, and in many other ways. I am working at a new school (in a new state) this year, and know they have computer labs instead of netbook/chromebook/laptop carts, which will make it more difficult for true technology integration. However, considering your post, this might be all my new school is ready for, so maybe I should appreciate that they aren't spending funds on technology they're not ready for just yet. Well said. Thank you for discussing this issue so thoughtfully. So often purchases are made under the gun of budget timelines, which I think is why stakeholders (like teachers and students) feel out of the loop. Your post suggests slowing, following an inclusive process, and having a conversation that begins with pedagogy. I applaud this. It doesn't change the "use it or loose it" dilemma, but I wonder what would happen if schools approached this with a long term plan. One that started by funding pilots and then discussed them as a community before heading whole hog in a direction. It's good food for thought. Thanks for getting the wheels turning and for introducing trudacot to me!